Trimble has introduced Siteworks Software version 1.1, featuring full GNSS tilt compensation functionality in standing, walking and vehicle modes, and support for the Android operating system. Construction surveyors can now capture accurate points without leveling the pole, making surveying in areas such as building corners accurate, fast and easy. In addition, Siteworks version 1.1 now supports the Android operating system, giving contractors the flexibility to choose the field device that best fits their needs and budget. The announcement was made at the bauma 2019 trade fair for construction machinery, building material machines, mining machines, construction vehicles and construction equipment. Bauma 2019 takes place this week in Munich. Using Trimble Siteworks and a Trimble SPS986 GNSS smart antenna, construction surveyors can take measurements faster and perform more efficient stakeouts. The solution was designed to shield magnetic interference, and it can be used effectively anywhere on a construction site. There are three modes available that support tilt compensation, so contractors can record accurate points while standing, walking or driving the site in a vehicle. Tilt compensation in vehicle mode is designed to capture higher accuracy measurements on steeper slopes from a moving vehicle, and more accurate volume measurements to save time and money on material planning. Easy to use for beginners and users without traditional training, tilt compensation allows points to be recorded more safely, eliminating the need to stand in the road to measure a traffic lane, for example. Surveyors can also measure points that they couldn’t before, such as building corners, edges of trenches and utility flowlines. Trimble Siteworks can now support a contractor’s bring-your-own-device (BYOD) strategy with Android compatibility. This is helpful for price-conscious users such as owner operators and utility contractors, or users who need a less rugged solution for lighter use. The option gives contractors the freedom to choose the device that works best for them, increasing the flexibility and affordability of the Trimble Siteworks Positioning System. 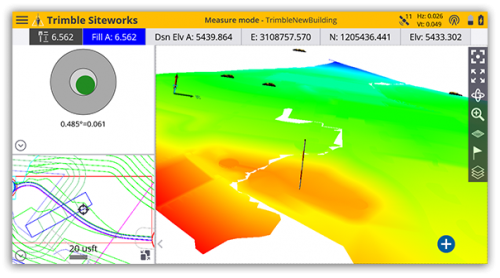 Trimble Siteworks Software version 1.1 is expected to be available through the worldwide SITECH distribution channel in the second quarter of 2019.